Last year we saw the Poké bowl take over, the popularity of oat milk sky rocket and the shift towards plant-based products continue to gain more momentum. 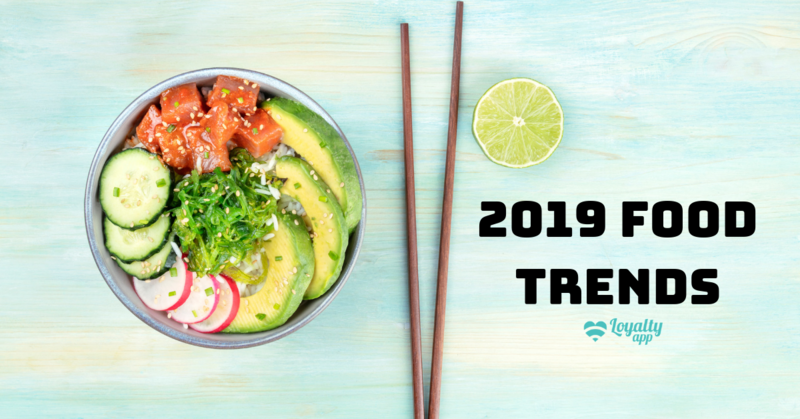 With a new year ahead of us we’re likely to see a whole list of food trends take shape as well as the growth of trends that we’ve become a custom to. Here are some of our favourite, fabulous food trends we can expect to see a lot more of in 2019. Last year this non-animal alternative to milk, became a big hit thanks mainly to its similarity in taste to regular milk. With more people opting for non-animal-based products and the continued search for a non-diary alternative for milk, oat milk is only looking to keep growing in popularity this year. The popularity of diets such as Keto and Paleo have shunned regular fats in favour of healthier alternatives. Expect to see a lot of coconut oils, coconut butters and vegetable fats that provide a great source of healthy fat. Natural fats will lead the way in 2019 with saturated and processed foods starting to take a back seat in the nutrition world. Made from the same grapes as white wine, orange wine goes through a different process and includes minimal additives. Despite the name, this new wine style doesn’t feature any citrus fruit at all. Popping up all over the place this new alcoholic beverage is set to become an ‘Insta’ pic favourite and summer drink staple. We’ve already seen the beginning of the movement as environmentally harmful packaging is on its way out (and rightfully so). Supermarkets are increasingly encouraging customers to bring their own reusable bags and some have even stopped providing plastic bags altogether. The plastic straws time is also limited with many restaurant chains banning them, and we can also expect to say goodbye to single-use packaging in the near future. Good news for the environment! Whilst we’re used to probiotics having a home in the fridge, expect them to start showing up at room temperature. They’re now making their way into shelf-stable products as the importance of having good gut health is more understood. With the science on probiotics still in its infancy however, there’s no guarantee the health benefits will live up to the hype. The meatless market is continually on the rise as more people opt for vegan and vegetarian alternatives to their favourite foods. One area that is sure to expand in 2019 is the meatless snacks department with vegan jerky, fake crackling and faux bacon all growing in popularity. We’ve already been shocked by the news of avocado ice cream has already shocked us so expect things to go further in 2019. The likes of hummus, chickpeas, and fruits will be invading your freezer this year. Again, the overarching health food trend allows these ideas to flourish as people constantly search for a healthier way to indulge in their favourite foods. Join Loyalty app and receive exclusive member deals on heaps of restaurants and cafes in WA. Earn Loyalty app dollars on every purchase you make at hundreds of WA’s best brands.